Things are changing on the Mac laptop front. When the 2nd generation MacBook 12 was announced and released yesterday, Phil Schiller said that the MacBook is Apple’s vision for the future of the notebook. That’s a big deal. We’ve also heard rumors of a 13″ and 15″ MacBook. Yesterday, the dates for Apple’s Worldwide Developer’s Conference were announced. Let’s see… Looks like the 13″ and 15″ MacBooks will be the top of the line. I’m thinking we will get larger MacBooks with a little more oomph due to their larger size. Larger size equates to more room for batteries that could handle more power-hungry chips. 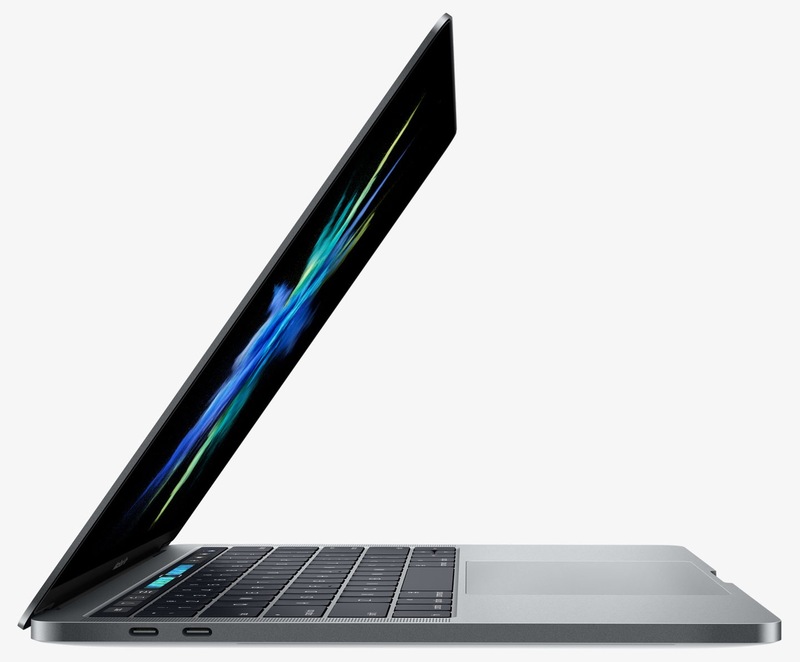 The MacBook 12″ would be the entry level model. The 12 is the smallest and lightest MacBook at the most affordable price point. Not sure whether the MacBook 13 will be called MacBook Pro or just the 15. Still, based on the history of the MacBook Pro, the 13 will be intermediate in price and the 15 will be higher and more full-featured. MacObserver was the first Mac site I saw yesterday that forecast the new MacBook Pros would be close in design to the MacBook 12. MacObserver guessed these will support Thunderbolt 3 via the USB-C port and might have a second USB-C port since there’s more room for one to accommodate a bigger 13 or 15 inch screen. I can’t imagine getting a 15″ MacBook Pro. Great for screen size but I wouldn’t want to carry it or have it on my lap. But what happens if it is under 4 lbs? If so, it gets interesting to more people. I’m much more interested in the 13″ MacBook. MacObserver predicts it will weigh well under 3 lbs. I will have to wait and see whether 12 or 13 seems more attractive once all the chips are on the table. If you have any doubts about the power of the latest MacBook 12 and would pay a little more if the right 13″ came along, you may want to join me. In 2015, this MacBook is all you need unless you are a diehard power user. I would rather wait once in a while than carry more than 2 lbs. The reviews on MacBook have been way too conservative and old school. Advantages. I’m not going to dwell on it. But, a gorgeous 2-lb Mac is a joy to use. Yes, this gold one looks awesome and the warm gray does too. 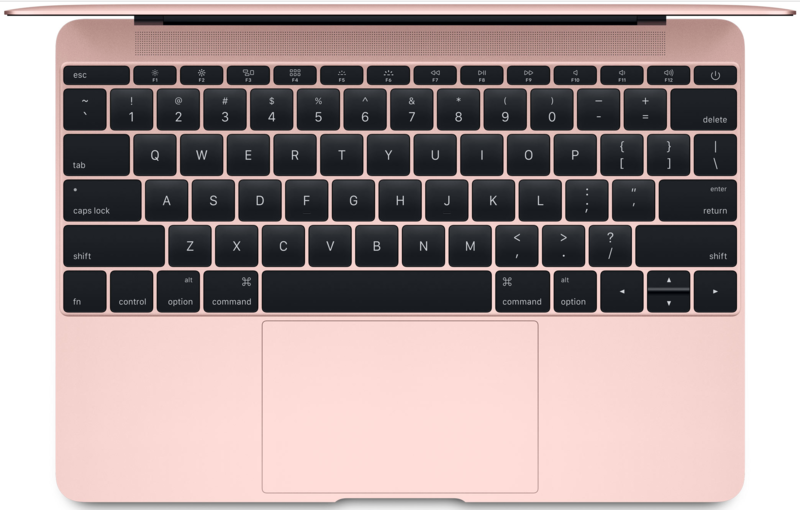 The force touch trackpad opens up lots of possibilities and certainly is the best trackpad Apple has ever made. The backlit keys look better than ever. The retina screen is as good as it gets. The USB-C port is state of the art and better than what you get with a brand new MacBook Pro or Air. The only knock on it is that there’s only one of them and it’s brand new so there aren’t as many accessories for it — yet. Power. I’m guessing only 5 – 10% of the computer-using population need more power than this. This is not an unpowerful Mac. Part of that is because it has a very fast state-of-the-art SSD in it. It’s got oomph for video. Yes, some of you need more power but you know who you are. The rest of us can party with a 2-lb Mac. Only 1 Port Besides a Headphone Jack. It seems that everyone is all concerned about the lack of ports. I got this MacBook over 2 weeks ago and I’m doing just fine. Yes, I bought a $19 adapter to go USB3 to USB-C. That handles connecting iOS devices, USB sticks and hard drives. You’ll live. With 9 hours of battery-life, you don’t need to plug-in all the time. This is the first mobile-first Mac. Times change. Thunderbolt Monitors — Not so Much. If you like to use your MacBook to drive a large Thunderbolt monitor and sit at a desk, the 2-lb MacBook may not be for you. You paid good money for a fancy Apple Thunderbolt monitor. You aren’t going to be happy that there is no adapter for Thunderbolt for this little guy. I’m not sure Thunderbolt is long for this world now that the powerful and versatile USB-C is rolling out. I still expect to see a USB-C adapter for Thunderbolt before long. There are quite a few Thunderbolt monitors out there and most of their owners have the bucks to buy the latest tech. Apple might even make an adapter if they get enough flak, but don’t hold your breath. VGA and HDMI Monitors are a Go. If you have a VGA or HDMI monitor or monitors, buy Apple’s new USB-C VGA or HDMI adapters for $79. These adapters let you connect your USB-C power cable, your monitor and a drive or USB stick all at once. 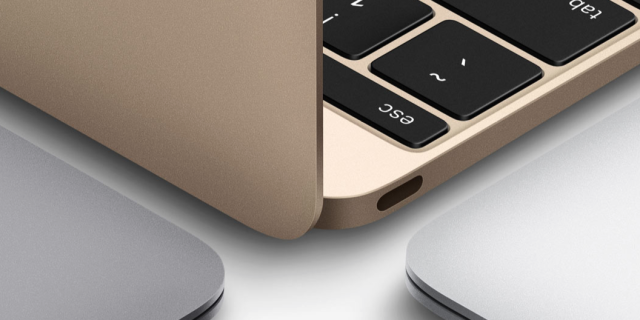 Your golden or space gray MacBook, even though tethered, will serve you just fine. The Always with you Mac. With this tiny 2-lb carry, you can be portable in the living room, bedroom or local coffeehouse with an ease you’ve never known. Maybe you travel quite a bit. I promise you this 2-lb Mac will compete with an iPad and will be your friend in the air and airport. We now have a handheld Mac almost. As you probably know, I have an Apple Watch and need to stand every hour come hell or high water. With the MacBook, I can be on a Skype call and stand up, carry it around for a minute, and get my stand in. If you are in the market for a new laptop this year and aren’t prioritizing on power at all costs, get this 12″ Macbook. It is smaller and lighter than the MacBook Air 11 with a bigger and better screen. The typing was fine from the moment I tried it in the store. I guarantee you the resale value on this state of the art Mac will beat the MacBook Pros and MacBook Airs hands down. Acquired Apple Watch on April 24. I went with the Sport Watch for the price and the lightness over the Sapphire lens. So far no scratches. Part of my thinking was that Apple does an awesome job with aluminum. The iPhone looks stellar, why would I want to spend more to get stainless steel? It’s the same wrist-computer, after all. And, like I said, I wanted light. Got the Space Gray with Black Sports Band. Working like a charm. Comfortable. Doesn’t bother me to keep it on all the time. Good to go! Yes. This is my dog, Spinner. 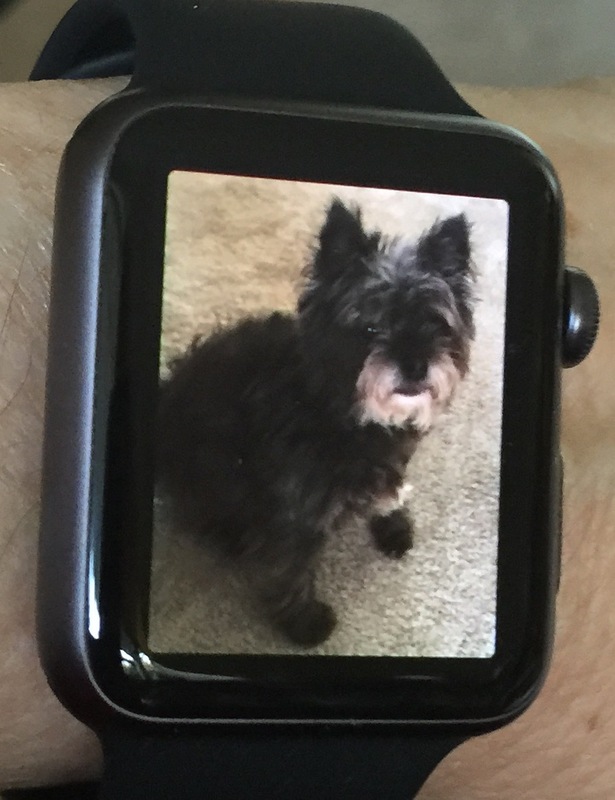 Kind of fun to have her on my wrist. Got the 42mm. This was a close call as I have small wrists. So the 42mm watch is pretty big on my wrist but I have worn bigger in the old days from time to time. And I survived. I went for the screen real estate and the extra battery life. No regrets. Does Apple Watch Meet my Expectations? It’s working great for my first goal of Standing regularly. This alone may justify the purchase. Actual Goal 1 was to learn about this new wearable computer something I’ve heard about for 20 years back when all this stuff was in the future. Now we have something real and backed by Apple’s economic power to change the world. My minimum requirements are good. I haven’t mastered notifications so they are hit or miss and sometimes I get haptic notifications and sometimes not. I’m sure more will be revealed but I’m busy right now with work so don’t have oodles of time to sort all this out. At least now the Apple Watch is on my wrist so I’m getting to experience this ground breaking new release from day one. The experience is pretty transparent, actually, if you don’t count getting dinged to stand up every hour. I usually beat it to the punch partly because I’m afraid I’ll miss one of my hours and I like to get as many Stands as I can per day at this point in the game. I don’t notice that the watch is on my wrist. That’s the transparent part. It’s just there. After a good 15 years not wearing a watch, it’s kind of handy to have one on my person. And in addition to my iPhone which might not be in an app that shows the time or is somewhere in the house but not on me. It’s pretty rare to not have the iPhone near, but the watch is really near. Even if it takes a half second to turn on. I have no doubt I will be wearing this watch for the foreseeable future. At least until next year’s version that is. I would love to be able to control some of the variables myself. One great candidate would be how long the watch stays on before going to sleep. I would push it to at least 20 seconds over the current 15 unless battery life got to be an issue. Looking forward to learning more and seeing cooler and cooler apps over time. Developers have had little to no time to learn how to take advantage of this device. As they learn and iterate, all sorts of improvements will be made.